A founding member of Phoenix Boxing Club in Lurgan has vowed that they will rise from the ashes after an arson attack this morning. Maurice Haughian, a coach and founding member, said he just can’t understand why anyone would want to damage the popular club. 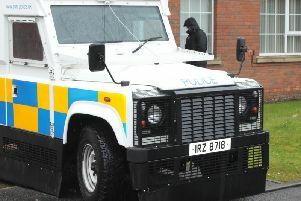 Police in Lurgan have arrested two men following an attempted burglary and arson attack on a the club at St Peter’s GAA Club in the North St area of the town early this morning, Thursday 25 February. Shortly before 5.40am police received a report of a fire at the club. Police and NIFRS attended and it was established that the fire had been started deliberately. Damage was caused to the roof and wall of the property as a result of the fire. A short time later police arrested the two suspects, aged 21 and 22, in the Victoria Place area on suspicion of attempted burglary and arson. They are both in custody assisting police with their enquiries. Maurice Haughian revealed the event had been captured on CCTV at the Club. “The gym is voluntary, people giving up their free time for these young people. “I don’t understand what possesses young fellas to do this. “This club is for the community,” said Maurice adding that it has been running for 16, five of which had been at the St Peter’s Youth Club premises. Maurice said the club had applied for funding and hope that it will be forthcoming soon. He said the boxing ring and equipment had been severely damaged. He revealed that there are several young boxers set to take part in championship matches but now they have no premises to train in. Although he has been amazed at the support from other boxing clubs. “That is the boxing world for you,” he said. Deputy Mayor Catherine Seeley has said the entire community is in shock after an arson attack. Chief Inspector Davy Beck is appealing for anyone who witnessed the incident or anyone with any information relating to the incident to contact Detectives in Lurgan Police Station on 101. Information can also be passed anonymously via the independent charity Crimestoppers on 0800 555 111.